April 9, 2013 - Version 4! The Most Accurate Real-Time Reverse Phone Lookup Available Anywhere Online - 99.9% Accuracy, 70% Hit Rate! We offer the World's BEST Reverse Phone Number Searches, Period. We are here to service all of our valuable clients. Q: Why Use Stump The Monkey For Your Reverse Phone Lookup Needs? A: Stump The Monkey provides current and useful information, making it the Best Reverse Phone Lookup service in the United States and Canada. Using software that has been developed by professionals with a history in the investigative industry, we can provide you with instant access to caller identities and information, whether you need help for a personal inconvenience or if you are a professional looking for consumer information. We offer the most comprehensive service in the business and can assist with the best reverse phone look up for landline numbers (residential or business), cell phone numbers or VOIP to give you peace of mind and control over your life. Q: What Sets Stump The Monkey Apart From The Competition? A: In business for the last three years we provide important Reverse Phone Lookup Cell services that can help you to keep record of what your kids have been up to, or help you to care for an elderly relative. If you are in the unfortunate position of suspecting your spouse is cheating on you or if you have been getting spoofed or prank calls, you can find out who the numbers belong to and get on with things as you need to. We offer aggregated results from the top sources, and because our data comes straight from telephone companies, it is always current and up to date. Because of our long standing relationships, we get exclusive service and are notified of numbers being connected or disconnected within 24-hours. Our comprehensive services encompass landline numbers, Reverse Phone Lookup Cell numbers and VOIP, where a lot of our competitors fall short. We can provide you with the data you need to match to the numbers that keep showing up in your life. What makes us stand apart from the competition is that we do not charge you if you do not find the results you need, a guarantee of great service. Why should you have to pay for something that you can’t use? We will refund you instantly if the numbers you are looking for do not yield any positive results. Stump The Monkey’s Reverse Phone Lookup services only charge one credit for a search and no annual or monthly charges or membership apply. We do not bill our clients on a monthly basis, and allow them to make once-off purchases or buy bigger contracts should they require them. Not all information about every consumer is available, but we make sure we get what our clients need. All cellphone contract holders are listed on cell company databases, but prepaid customers may not be registered. In addition there are some people who elect to have their details emitted from listing. But, with a 70% hit rate, we can almost guarantee that we will find what you are looking for, and if we can’t, you won’t be charged for it. Because of the sensitivity of consumer information from cell phone companies, many reverse phone look up companies do not offer the cell phone service and if they do, it is very restricted. We offer comprehensive reverse phone look up cell services as well as caller ID searches for all kinds of lines. We also offer our tracing service on VOIP lines, something that very few other companies can offer. Go Ahead - See why we have the Best Reverse Phone Lookups! We Reverse the impossible Hard-To-Reverse Phone Lookups! Q: What Would You Use Stump The Money’s Services For? A: Using our services can also help you to save money. How many times have you opened your phone bill only to find a slew of numbers that you do not even recognize? By using Stump The Monkey’s services, you are guaranteed of the Best Reverse Phone Lookup service on the market, at the most competitive pricing options. If you are someone who just needs to check one number, we have a cost-effective solution for you. If you work for a company and need a big contract so you can research multiple numbers, we will be able to offer a solution better tailored to your needs. If you are doing research and need to find names for other companies, we can also help you out with a solution. If you have lost touch with an old friend or need to find out who a phone number belongs to, you can make use of our convenient service. Q: How Does The Reverse Phone Lookup Process Work? A: If you have ever come across a scribbled telephone number of your desk pad and not been able to recall who it belonged to, or keep getting calls from an unknown number, then Reverse Phone Lookup could solve your frustrations for you. 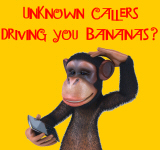 If you have ever opened up your telephone account and found calls to numbers you do not recognize, you can trace them back and find out who they belong to by using Stump The Monkey’s Best Reverse Phone Lookup. Whether you need help with a landline, cellphone or VOIP number, Stump The Monkey offers the best resources to help you find out what you need to know quickly. What’s more is we offer the most updated information available, as we receive our data directly from telephone companies, cutting out intermediaries, and offering you resources that have been refreshed within 24-hours. Q: What Is a Reverse Phone Lookup? A: Reverse Phone Lookup Cell services have replaced the traditional, printed paper telephone directories that used to be in homes across the country. The internet has given us a number of conveniences, and digitalizing personal information is one of those perks. Stump The Monkey offers a fully comprehensive service and the Best Reverse Phone Lookup service on the market, boasting a 70% hit rate on searched numbers. The software on offer by Stump The Money has been developed by software professionals who have experience in the investigative industry, and the company offers first class support and a three year track record of success. With Stump The Monkey, you pay only one credit for each search and you do not have to worry about any monthly or yearly fees, something you need to look out for on competitor websites. Q: What Kind Of Reverse Phone Lookup Services Are Available? A: Stump The Monkey offers the most comprehensive data services for landline numbers (personal, residential or business information), cellphone numbers and VOIP, something that a lot of other companies do not. Q: Why Would You Need Reverse Phone Lookup? A: Some of the reasons that you might want to consider our services for personal use could include to keep tabs on a spouse who you suspect is cheating on you, following up on the whereabouts of your children or elderly parents, avoiding telemarketers and investigating harassing or unknown numbers. Professionally private investigators, law enforcement departments and financial institutions make regular use of Reverse Phone Lookup Cell services to find out information about consumers. While Reverse Phone Lookup Cell numbers are available to local libraries, police and federal law enforcement agencies free of charge, consumers have some limitations in terms of the information that they are allowed access to. There is some debate as to whether this kind of information should be made publicly available, and some people choose to delist themselves from the services as a result. Getting information associated with cellphone numbers can be more challenging, because the information belongs to the cellphone company that owns the database. Cell phone reverse lookups usually cost a little more than landline services to cover the costs of sourcing the information, and not all companies offer this service; or if they do, it is a limited service. Stump The Monkey provides information that is both relevant and up to date, and if you do not find a result to match your search you will not be billed for the service, no questions asked. Whether you are being plagued in the middle of the night or early morning hours by prank calls or want to check up on your spouse’s whereabouts Stump The Monkey can give you access to vital information about the number’s or caller ID that is causing you worry. If you represent a company and need more detailed information, we offer the best results on the market by aggregating results from a number of different sources. April 9, 2013 - StumpTheMonkey Version 4 is Now Online! Call us at 954-623-7475 Please note that during times of high call volumes, we may not be able to respond immediately. It is recommended that you Email us so we can track your request better. Find the Owner of ANY Phone Number! Find OWNER NAMES When Others Can't! Our Data comes Direct from the Telco Providers and Provisioners (the ones that issue phone numbers), so we cover ALL the major providers including AT&T, SPRINT, VERIZON, T-MOBILE, METROPCS, NET10, VONAGE, VOCALOCITY, etc, etc. Stop Wasting Time and Sign-Up Now for the World's Best Reverse Phone Lookup! Most people just want Results! Not Excuses, Runarounds, Hassles, Gimmicks or STUMPS. We give you just that - RESULTS! Our Stump Rate (where No Data is Found) is BY FAR the lowest in the Industry and we have the statistics to back up our claims. Q: Why can't I just Use Google? Doesn't Google have the Best Reverse Phone Lookups? A: Hundreds of thousands of phone numbers are activated and deactivated on a daily basis. Google takes time (sometimes months) to index all the websites they crawl. By then, the data is already old. So, very likely, you will be finding old data in your reverse phone lookups. Telemarketers, scammers, and criminals change their numbers often for a reason. Our data feeds directly from the Telco Provider Networks for the most Accurate and Current Best Reverse Phone Lookup and Search Information available. Also, most of Google's results come from Databases that are populated by people that complain about a specific phone number. This cannot be counted on as a definitive source as many Telemarketers use Caller ID Spoofing to make their Caller ID appear to be from a different or legitimate source. Good Information on Reverse Phone Lookups is just NOT available for free. But StumpTheMonkey.com has the Best Reverse Phone Lookup at a very affordable price with our No-Hit/No-Fee Pricing. Q: What about the Other Free Reverse Phone Lookup and Search Sites out there like White Pages, Yellow Pages, ZabaSearch, and the hundreds of other clones out there? A: The Free Websites rely on Ad Sales to fuel their Lookup and Search business. White Pages, Yellow Pages, and other websites like ZabaSearch can only survive with Ad revenues. Since the lookup results are free, it does not matter whether you get the results you were looking for or not. The lookup is free anyway, so if you don't get your information, so what? Their Stump Rate is very high as they do not have time, revenue, or resources to keep their data current continuously. Most of them do not offer the Best Reverse Phone Lookups for cell phones, best reverse phone lookups for voice over IP ( VoIP ), or best reverse phone lookups for business at all. Q: What about the Other Sites that offer Unlimited Monthly or Yearly Plans? A: Unlimited plans are usually offered because the Stump Rate is so high. Some of these services have huge Stump Rates of over 60% (that means that only 4 out of 10 reverse phone lookups and searches will yield you results). The Stumps are especially high with Reverse Phone Lookups for Cell Phone Numbers, Reverse Phone Lookups for Voice Over IP (VoIP) Lines, and Reverse Phone Lookups for Businesses. With statistics like this, they HAVE to offer unlimited plans so customers don't keep asking for refunds. With unlimited plans, they can always say "Well, you have an unlimited plan - so just lookup or search for a different number - it doesn't cost you anything" - but at the end of the day, YOU DON'T GET THE INFO YOU ARE LOOKING FOR which is why you are using the reverse phone lookup service in the first place. Q: But there are literally hundreds of Reverse Phone Lookup websites out there and they all claim to be the best. Who can I trust? A: If you have spent time on other websites trying to reverse a phone number, you will notice that ALL of the services out there will give you the general location and charge you for the name or address or other piece of information. The location information is already coded into the phone number. The Area code tells generally which area of the country that phone line is in (or was issued in) and the next three numbers (exchange) tell you more specifically the geographic location of the owner of the phone number. This information, however, is quite useless. This information is already available for free on many websites. Our service actually goes out to the telephone companies to do the best reverse phone lookup in real-time. This means that you are getting the most current data (including the subscriber name) as part of your reverse phone lookup. We charge our clients for the data only because the telephone companies charge us for the data. We charge for the data because we have the best hit-rate of any reverse phone lookup service available. We also have a "No-Hit/No-Fee/No Questions Asked" policy where if you do not get a name, we will credit your account for the search. Use StumpTheMonkey for the Best Reverse Phone Lookup. Q: What Best Reverse Phone Lookup Sites does StumpTheMonkey.com compare to? What do they Charge? and How Good are their Results? No Results No Fee for Stumps? No Questions Asked! Aggregate Reverse Phone Lookups from Multiple Sources? Absolutely NO! NO! Yes NO! NO! NO! Rate the Results After Viewing? Coming Soon NO! NO! NO! NO! NO! NO! 800, 888 Reverse Toll Free Searches and Lookups? YES NO! NO! NO! NO! NO! NO! 877, 866, 855, 844, 833, 822 Reverse Toll Free Searches and Lookups? Coming Soon NO! NO! Very Limited NO! NO! NO! Q: Who uses StumpTheMonkey's Best Reverse Phone Lookups and Why? A: StumpTheMonkey's Best Reverse Phone Lookups can be used by anyone. We have many customers (people checking on cheating spouses, keeping tabs on loved ones, children, or elderly for safety, investigating unknown, harassing, or annoying phone calls and SMS Texts) and many professionals (Law Enforcement, Private Investigators, Bail Agents, and more) using our reverse phone lookup service. CallerID Spoofing - You receive a call with a fake or bogus CallerID. Look up the number to verify the owner. Run the Best Reverse Phone Lookup search available and find out who has been calling you. 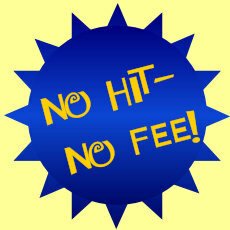 Our Reverse Phone Lookup service is No-Hit/No-Fee and with our over 70% hit rate, you cannot lose. Q: Why are Reverse Phone Lookups on Cell Phone Numbers and VOIP Lines so hard to find? A: If a cell phone is purchased and activated on one of the large networks (such as AT&T, Verizon, Spring, MetroPCS, T-Mobile, etc. and the subscriber is a "contract" customer - I.E. the customer buying the cell phone is on a monthly contract for two years, the subscriber information is automatically added to the telephone carrier's directory. However, if someone purchases a pre-paid cell phone (such as NET10, or other prepaid service) the subscriber information is usually not added to the carrier's directory as there is no subscriber information provided at the time of purchase. Thus, certain cell phone lines, and certain VOIP lines will not report owner or subscriber information on a reverse phone lookup. These numbers cannot be reversed - by anyone. The following table should help you to understand which companies typically add "contract" customers to their directories. Q: How long has StumpTheMonkey provided the Best Reverse Phone Lookup Services? A: StumpTheMonkey has been online over 3 Years proving the Best Reverse Phone Lookup Services to our professional clients as well as consumers. Our Best Reverse Phone Lookup has been used to track down wanted fugitives, suspected criminals, cheating spouses, unlawful public conduct, harassment and much more. We work close with authorities in providing quick investigative solutions to Reverse Phone Lookups. So, just get on with it - Just get the results, the data, the info. 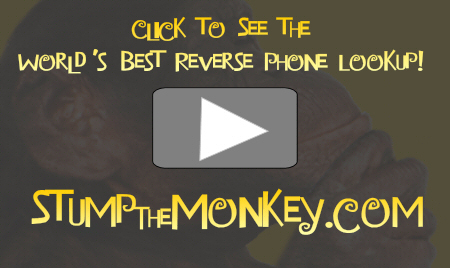 Try StumpTheMonkey's World's Best Reverse Phone Lookup Now!